Palm and Cycad Exchange is a family-owned business specializing in buying and selling palms and cycads. Cyadophyta have been our specialty for over 40 years. Consultation as to proper placement and care of your plants, so that you can be confident that your palms and cycads will THRIVE! Enjoy learning more about these hearty, drought tolerant plants and how to care for them. When you sign up for our monthly newsletter, you will receive helpful information and timely articles on caring for cycads and cycads. PLANT LOVERS AND GARDENERS – Cycads and palms add shape, texture, and exotic beauty to any garden or landscape, from desert to tropical. LANDSCAPERS – You can purchase a single plant to add interest in a personal garden, or several to add a distinctive look to a larger landscape project. There are a variety of price ranges available. SELLERS/GROWERS – We can assist in brokering your special palm or cycad, or assist in the sales process of your collection/nursery. Due to security concerns, some sellers may prefer to remain anonymous, and we can arrange for plant drop off and pick up either at your location or at a separate meeting place. COLLECTORS - If you are looking for a specific palm or cycad, and you don’t see it in our current inventory, contact us. We can often locate just what you are looking for. 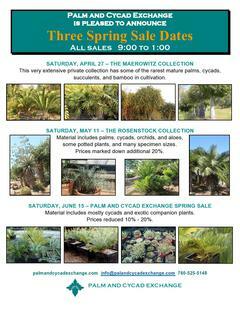 To see names and pictures of our current inventory, go to the Palms for Sale and Cycads for Sale tabs above. When you click on the tab, you will see a full listing. Or go to the dropdown menu and choose the specific plants you desire. If you have questions, call us during regular hours or use the Contact Us form and email us. Be sure to sign up for our newsletter to receive monthly tips as well as notices of special events and sales.